Warhawk is a fast-paced multiplayer third-person shooter, vehicle and flight combat game developed by Incognito Entertainment exclusively for the PlayStation 3. It is a remake of an aerial warfare game of the same name, which was a launch title on the original PlayStation. Apart from the similarity of controlling aircraft, the remake bears little other resemblance. It was the first PlayStation 3 game to be available both for download on the PlayStation Network and for retail on BD-ROM. There is also a free downloadable demo available on the PlayStation Network. For the United States, Blu-ray and PlayStation Network versions were released on August 28, 2007. The PlayStation Network version was released in Europe, Australia and Japan on August 30, August 31 and October 4 respectively. The Blu-ray disc version was released in Australia and Europe on September 20 and September 21, respectively, but was not released in Japan. 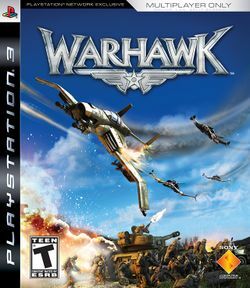 Warhawk was initially intended to have both single-player and multiplayer modes, however the single-player element was canceled during development due to concerns that it was inferior to the game's multiplayer component. The game was released with five maps (each with five possible configurations) and four game types, Deathmatch, Team Deathmatch, Zones and Capture The Flag. After the 1.4 update, the number of game types increased to six with the addition of the Hero and Collection modes. Warhawk was met with a generally positive reception by reviewers. However, after launch it was plagued by connection and server issues, including ranking issues with players which were subsequently corrected in updates. The player is able to rank-up though 20 ranks ranging from Recruit to General. Warhawk is primarily a third-person shooter set in a fictional, perpetual war between the Eucadian and Chernovan armies (blue and red team, respectively). There are two original ground vehicles, a jeep and a tank, and an Armored Personnel Carrier is added by the Operation: Broken Mirror expansion. There are two original air vehicles, the Warhawk and Nemesis (which are only cosmetically different), both of which can use 9 aircraft weapons. The Omega Dawn expansion adds a dropship, and the Fallen Star expansion adds a jetpack. There are three turrets available to the player (missile anti-air turret, flak anti-air turret, and the .50 caliber anti infantry machine gun). The game uses the PlayStation 3 Sixaxis and DualShock 3 controllers. The game can be set to make use of these controllers' motion sensing function to allow the players to control aircraft and ground vehicles by tilting the controller in different directions rather than the more conventional methods of using the D-pad or analog sticks. However, a traditional control scheme is the default option. Warhawk offers online and offline multiplayer play. Offline allows for 1-4 players splitscreen (without bots). Online features up to 32-player battles, with the ability to have up to 4 players use one PlayStation 3 in split screen mode (on non-ranked servers that permit it). Players 2-4 can enter or exit the game while a match is in progress. The game uses medals and rewards, which are awarded for certain tasks. As of v1.50, the game supports trophies, which will be used in the online service PlayStation Home. Players are also able to customize their characters with armor squad markings, Warhawk paint schemes, and other accessories. More customization options are unlocked as the player increases in rank. Warhawk also allows the creation of clans, which may participate in online events and competitions. The game also makes use of arbiters, paid anonymous players who are tasked to find cheaters within the game. They are able to punish offending players in several ways, such as an email warning, a forum post, a kick, or a temporary/permanent ban. Warhawk Arbiters can also request that the Warhawk's stats be erased. This page was last edited on 17 April 2012, at 06:53.